Hothouse flowers grown in greenhouses around the world have made roses available in winter and tulips possible in fall, but the best part of fresh flowers can sometimes be bringing a bit of the season inside. For this reason, choosing flowers that are in season not only ensure they are at their freshest and most economical, but that they match the mood of the months as they go by. Like pages on a calender flipping by, the leaves around us grow, change colors and flutter to the ground each year. Choosing greens that reflect the season outside are a detail that is sometimes overlooked in flower arrangements, but can add so much to the decor when properly chosen and placed. Spring sprigs and lush summer leaves are easy to find, but choosing winter greens are not as much of a challenge as you may think. Here are three fabulous foliage choices for the coldest months of the year. The silvery leaves of this summertime annual will last long into the snowy months of winter and can add a bit of shimmer and softness to any winter arrangements. The downy leaves are wide and flat, but deeply lobed, similar to a fern, which gives them a fine, feathery texture. The sharply defined edges of the leaves almost resemble snowflakes. They make great additions to corsages or boutonnieres and longer ones can be added to a centerpiece or short vase. Their silver coloring makes dark reds pop, so try them with a burgundy mum or blood-red ranunculus. 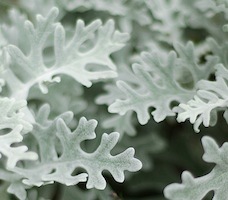 The sharply defined edges of the leaves almost resemble snowflakes. 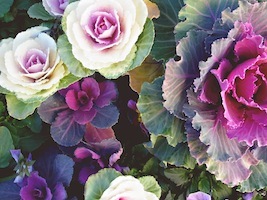 No longer just for sauerkraut, growers have developed several varieties of spectacularly colored cabbage which can hold their own against any number of fancy flowers. Ornamental varieties come in red, purple and white varieties that form rosettes that can range from several inches to almost a foot in width. Sturdy, long-lasting and unique, ornamental cabbage looks more like a flower than foliage, but will look absolutely lovely mixed into vase arrangements. 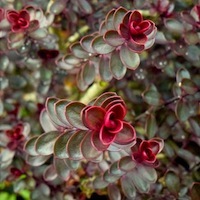 The shiny leaves of this evergreen shrub have been a perennial florist favorite for vases and centerpieces. 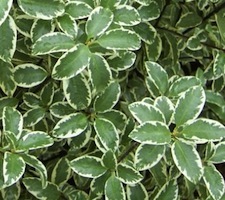 Long-lasting and easy to use, the whirled leaves of pittosporum come in a combination of green with frosty, white edges. Faintly scented, the branches of this elegant green can be used in vases or centerpieces for a fresh and look. Try mixing with berries or pine cones gathered from outside for a seasonal look that will make you glad it’s cold outside.